Please note: This data has been updated across all three Community Insight sites; England, Scotland and Wales. To see this latest unemployment data in your reports you must generate new reports for your stock groups. To do this, simply click Request Report on the Manage Stock Groups page. For more information about the Reports in Community Insight, check out the Report section in our Knowledge Base. To see a list of all of the indicators available in Community Insight check out this Knowledge Base article. If you have any questions about the new data updates, please do not hesitate to get in touch with us on support@ocsi.co.uk or give us a call on 01273 810270. The development team here at OCSI are always working on a number of different projects. And looking for ways in which work from one project can be used to improve another and make your user experience even better. Today we are rolling out a collection of these improvements. We noticed that people are creating more and more stock groups in Community Insight and it is great to see people making the most out of the stock groups feature! As a result we have adapted the way you can search for your stock groups, on the Map and on the Manage stock groups pages, to make it easier for you to find specific areas within a long list. We’ve also made some minor improvements to help people understand and effectively use the Dashboard. Previously when you wanted to view a stock group on the map, you would click on the stock icon and select the stock group from the drop down box. We have now created a specific button for stock groups. This new button is called the Areas button and can be found nestled between the stock and settings buttons on the Map page. Click the Areas button and a list of all the stock groups on Community Insight with a filtering option appears. Use the filtering box to type in the name of a particular stock group and then select that stock group to view on the map. Next to each stock group is a little information icon. Click on this icon to open up a popup detailing information about that stock group. Information includes; a list of stock within the area, how the stock group was created, when it was created, who created it and which constituent regions are contained within the area. If you are a group admin or power user who creates stock groups for your group, you will also see improvements on the Manage stock groups page. We have added a filter box so you can easily zoom to a stock group within a long list. To refresh your knowledge on the different ways of creating stock groups in Community Insight, check out the stock groups section in the Knowledge Base. The Dashboard is a great way of visualising how your stock groups compare to one and another on multiple indicators. To ensure that everyone understand how the dashboard works and what it is showing, we have added a link to a detailed Knowledge Base article. Hover your cursor over the colour key in the top left hand corner to find the link to the Knowledge Base article. If you haven’t used the Knowledge Base before, it is full of bite sized articles which help you get the most out of Community Insight. It can be found on the Support tab in the top right hand corner of Community Insight. We are always looking to add new datasets into Community Insight. So, we are really excited to announce that we have now added Big Lottery grant data to the tool. If you’ve ever bought a lottery ticket, you can now use Community Insight to see where that money has been spent! 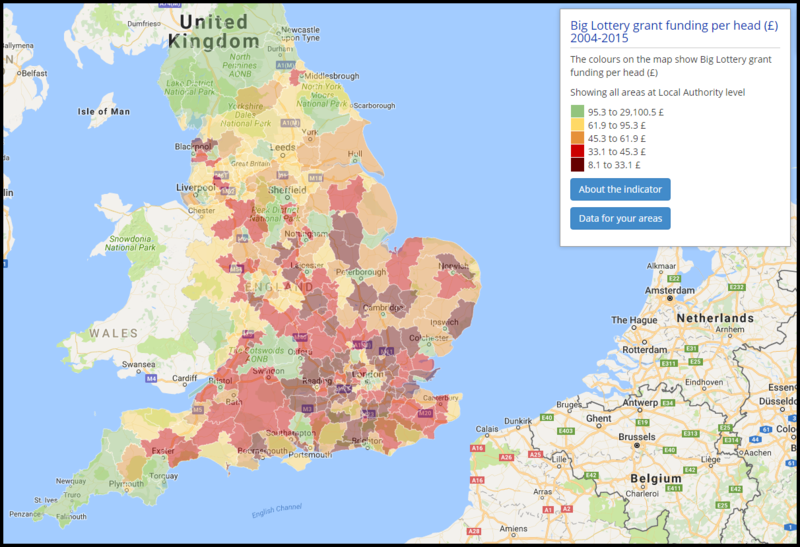 The data is published by the Big Lottery at Ward level and we have apportioned it down using population weighting at Output Area level to provide data for your custom areas. To find out more about the raw data see the Big Lottery website. Question assumptions made about how grant money has been spent across the areas you work in. Build up a picture of how grant funding has affected your communities over the past 13 years and see whether there are any areas which have received little to no funding. Measure if there is a correlation between levels of grant funding and areas of deprivation. To find these new indicators in Community Insight click on the Group Admin tab and go onto the Manage Indicators page, search within the Unassigned theme for the full names of the indicators (see above). If you need a reminder of how to add new indicators to your maps and dashboards, check out this article in our Knowledge Base. To see a full list of all the datasets available in Community Insight check out this Knowledge Base article. If you have any questions about these new indicators, please do not hesitate to get in touch with us on support@ocsi.co.uk or give us a call on 01273 810270.